This song is one of my favorite, to looking back the memories and views are left in joy. The scenes of this song displace almost the places we roamed as children and it’s always worth watching and listening to this song. After some browse, good I found this song in YouTube, hope u too enjoy listening. Check out the song in the left sidebar which as current congenial song and the translation of lyrics below, but not sure if I translate it correctly. the beauty parrot in our views comes around. glooming even cloudiness is high. is uneasy of raising warmt. never the summer so thermal. looking heavily across sky in hope of rain. Have heard children drop out of schools, for very first time saw the babies dropping from top of temple\mosque. Bizarre is word perfectly befit for some Indian people to show varieties and introduce new superstition which could wonder and astonish in shock. The children buried under soil and brought out alive; hopping just leaving kids lying before; beating girl children in sweeper to avoid bad evil and we seek more the list goes on, but what I saw in television tidings the clipping was wretchedly cruel. There were two three people standing atop of a temple and dropping children one by one who are no more a-year-old. Where a crowd of people below hold a white dhoti, in that children are to fall and jump like a frog from water so the parent catch them. What if happen they miss the catch, even the catch is not easy in cricket. Breath skips as watching the worst thing is discovered. The incident taken place in Rajasthan is certainly equal to the matter I read in net; where the same ritual is preceded in Karnataka’s Bijapur district. The dropping of children is between one or five years from at a height of 15-20 feet, where in the above incident it’s only the babies to drop from 50 feet height! Whatever the reason people make there babies to drop from the top which would bless with good health or clearing bad evil. There is none can other than the own parents of the children would be best care taker of their dear ones? And how come these people knowing the present of there babies and the pain of giving birth, and still gives the sightless hope more important and put their own children at risk. To me for anything to think, its there lack of knowledge. Every one is conscientious but the insignificant practice of decades and the pressure of ignorance make to fall under false belief. As the world and knowledge begins to grow well we really need for the changes which we must use the awareness tool to repair or clear the older and rust irony thoughts; and as we grow and the increase of significant through knowledge, it helps to stand and think individual not along one in shouting at crowd. India’s PSLV C-9 successfully launched with 10 satellites for the first time worldly. Information technology, television programming and for some more India is launching satellites from Satish Dhawan Space Centre in Sriharikota. It’s the 13th time PSLV rocket is bearing over the satellites heavier than before which itself weighed 230 tons and heights of 12-storey building. Like all, I was expecting and looking this to be successfully put on its path. This is India’s one of an important launch with a satellite weighting 690kg highly agile Cartosat-2A, bearing an Panchromatic camera to cover maximum 10 km surrounds in black and white; and it is an advanced remote sensing satellite which is capable of providing scene specific spot in images. With this our country would be inspecting the service of interior structural roads and for investigation work. Except from the 8 other nation’s nano-satellites which weighted totally 50kg, India’s Indian Mini Satellite-1 the 83kg is also on the PSLV with Multispectral and Hypersepctal camera for remote sensing. Worldly there is no nation to sent 10 satellites at a time, where it’s a record braking of Russian and European rockets bearing maximum of 8 to 7 satellites. The PSLV rocket that was launched at morning released the satellites in continuation of 45 to 100 seconds from very first of Cartosat-2A on its path to start operation at 635km from earth. Apart form the 10 satellites; it’s the power of PSLV developed by Indian scientist to be appreciated for this grand success where doubling from the 4 satellites to 10 with nation own technology. Confusion rises when many things to pick, many thoughts to think and many works to finish. Human is incapable to do everything at a time, so it’s our decision to pick which. Take choose the correct answer option that comes in quiz and in institute examinations; where we need to tick the correct answers from the gives choices. This one is an easiest way in all to score marks, but here comes the confusion. When u knows the correct answer for the given question you are put in pleasure, for those unaware of answer where sent to confuse to tick between choices to decision. Was tagged by Friend Priya, have a nice time. Anjathea, one of a best Tamil film and first film of this year I watched. Celebrating Silence, lessons on Art of Living by Sri Sri Ravi Shanker. The Week magazine; which helps me in developing my reading interest. Like all, when rain hit the soil and the smell of eucalyptus comes in breeze climbing my favorite hills. The sound creates by wind during rainfall, purling stream and the sea waves. Noting like that; but sometimes had at these places while traveling. 10. FINISH THIS STATEMENT. "IF I HAD A LOT OF MONEY I’D...? Maruti 800, still it was my long used car. Would read and learn more… and do what ever the mind wishes. I never ate broccoli, but I like cauliflower more than its stems! No, I don’t like coloring my hair. Adventures, Tennis and Cricket, only the finals. She is beautiful in expressing her thoughts. 21. WHAT'S UNDER YOUR BED? No......! I really don’t hope in again and also I wish no one to born like me. 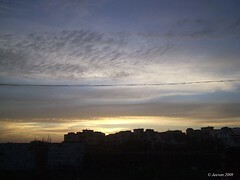 Morning person like to save for night, including light. Anywhere that discloses space neither near window nor door. 28. OF ALL THE PEOPLE YOU TAGGED THIS TO, WHO'S MOST LIKELY TO RESPOND FIRST? and the night dream ends eternally. 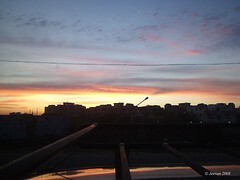 Traveling early morning is pleasure always, since it gives freshness in mood and views before sun dawns. The power or energy could feel as the tender waves of sun carried on body. Every time which ever progress is never disturbed, still I could count on the days that pleased waked early for travel or any other special days. Just like that a day recently happen in the 150km travelling to Sripuram, a 12km away from Vellore. This was planned that went on 6th; it wasn’t prepared if there was no urgency by my grandma to visit Sripuram where her relatives and neighbors have gone through conversion with her of the newly built Golden temple there. 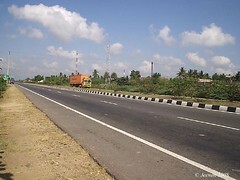 Something that amazes me is the National Highways 46 that connects Chennai and Vellore. 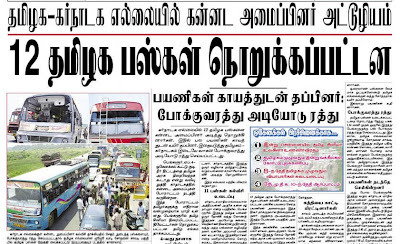 It was nearly 10 years back I went on this stretch that takes hours to cross because of rough; but today it was no more than two-and-half-hours to reach Vellore. Seeing this road I couldn’t resist the Vadivelu’s comedy in film Vetri-kodi-kattu, that ‘in Dubai we could put the food on road and eat,’ that clean the roads are being. And has to congrats the highways department for giving a smooth road and the private authorities to maintain it properly without a small contour for our payment in tollgate. Commonly Vellore is known for two. One is Vellore fort and another is high sunshine; but great time it was normal when we went. The town is surrounded by rocky hills, not broadens streets and congested shops before the CMC, one of a best hospital in India. 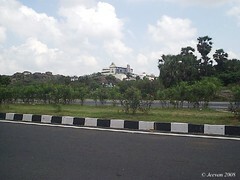 The Sripuram is just 10 minutes drive from CMC, looking towards a green hill summit. The golden temple which is covered by gold on the structure in sum of 300 crores is located in sripuram, one of the current busiest holy spaces for many. More than gold temple, the surrounding is idolizing for its beauty with green and fresh summit with grasses, flowers and fountains. The view of the temple is in star shape, where one could walk for three km along the star way to reach the center of divine. Existence of joy for mind when walking (me wheeling) along with cousins and parents the 3 km stretch and the boards reading beautiful thoughts either sides of the path is to give positive thoughts going through all, but I miss many messages. Keeping silent would better make us and others to put in peace and pleasure enjoying the atmosphere completely, but it was nosier of talkative walkers. We were early leaved the temple unexpectedly of fewer crowds; neither should we have staying sometimes unless we have some more temples to visit. The very useful thing the temple has is the facilities for wheelchair moving, even they have owned for people with walking trouble that helped my grandpa for reaching. One thing that disappoints me is, they are not allowing cameras inside the premises to take beautiful picture of this place. 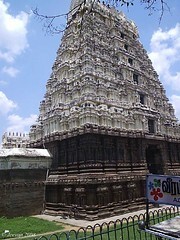 On the way, we stopped for Jalakanteswarar temple inside the Vellore Fort. 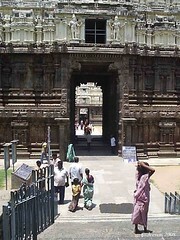 This very old temple is specially consists for its majestic rock sculpture and for lord Shiva. The fort which is maintained by Archaeological Survey of India seems important for much occupation and this temple tower visible from every distance is perfect picturing and its white coloring. The moat surrounds the fort has a small boating and garden. From there is another temple 25km away is Ponnai, a small temple inside a village. To my wonder, the streets of this village and the pass away are so neat, simple glances beautiful and could teach our city people the support of quality environment. So sadden, there was no power in batter to bring the pictures of this village. The very thing about this trip is not the destination, but the distance I covers traveling and sighting new places. Its Simple pleasure than nothing anything special. Oh, it was a disappointed dawn the last Saturday, where dad waked me giving a shock that Woodlands was closed late night. 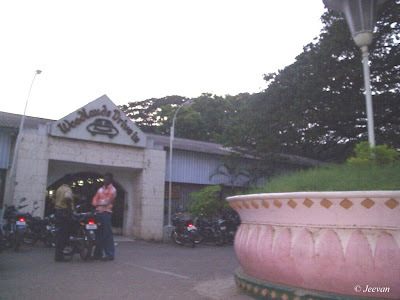 Woodlands Drive-in is more than a restaurant to me and the second favorite place in Chennai next to beaches. Soon I hearing the voice, moments in mind passes as images before eyes, and can’t even imagine the closed gates of woodlands, which I have never seen, where the hotel operates everyday. I was visiting there from my childhood days where I could remember and even dad used to take me there when I am only 2 years, and we often spent our Saturday evenings at the playing space inside the drive-in. In centre of the city near the famous Anna Flyover with many huge trees and comfortable parking space, the restaurant operates with little calm inside with birds sending sweet noise. Those days woodlands means great joy for me and bro who usual go there for playing at the swings, seesaw , spinning wheels and sidings. There was a horse ride also inside the Drive-in for children safari; where we could find a lazy horse or it was very old one moves slowly a round. I was the one to get fear of horse, and have gone on it ones, but my bro has went many rounds without fear and sometimes its hard to move him from riding. These are happened nearly 7-8 years back, and I never know the playing things are still working, but the horse riding is no more. Before, I wish to enjoy the comfort people having there food sitting inside there cars, but we were without car that time; today enjoyed the food as I wished, but could not spent in those playing space. I couldn’t take it easily that my favorite place is closed now and the only restaurant I visit and could visit is no more and can’t hope it will be reopen, because of the government decision to create a big horticulture research center and a botanical garden like the Bangalore’s Lal Bagh in the18 acres of land. When ever I think about woodlands, I could be able to visit in a week or more days, but now I can only have memories and the thoughts will never exist. Last time I was there in February for meeting our blog friend Thooya; good time we haven’t get space inside the hotel, so we enjoy the moment under trees and special is footing in woodland after a long time and in my wheels. The only dish I like more is the plain dosai, which is my favorite dish too and it is the special I think about Woodlands. Really I miss more the pleasure this place gives me. Whether the land is occupied legally or illegally, it would be glad if the restaurant been allowed to continue there with parking. I know it will not going to happen, any wish will not take back the govt. decision. I wish the garden which is yet to come won’t destroy the trees. Just back inside blog, overcoming the typing problem… and will check everyone soon. 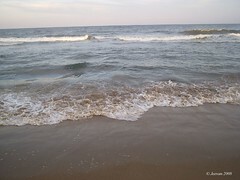 On one weekday went to beach with cousin; there I had a beautiful sight of sunset which is here in pictures. 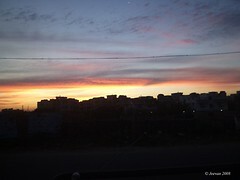 This is something rarely I find the sky in colors, I don’t know whether it was the often sighted in evenings, where I come out watching sunset is not usual. Take care. I am not going to be lost, but was losing myself in something, ever that could be a change. Some troubling time with my PC operation and of died UPS… letting for a change. Take care everybody, I will be on and off for sometime. It was disturbing; the violence continues its boarder crossing hurting innocent people. The anger people in Karnataka still continue there inhuman acts which starts 4 days ago is getting stronger were dozens of buses where stoned and many passengers were hurt by fools yesterday showing there oppose for Hogenakkal drinking water project seems the human life is unsecured those entering Karnataka. I just worry ones the mad men are mindless to hurt the innocent people, much time will not take them to go beyond imagination. Damn! Those who are seeing distinguish within nation will not remain for unity, which is evident today where it feel the whole state (both states) is strong enough to support there community along language for what ever cost the matter. What is happening currently made me think that the direction is turning somewhere from the true cost of the protest and opposition. The ongoing hunger strike by Tamil and kanada film industry is like just adding fuel to the burning fire, where both are just passing strong words and it is really gives an unfamiliar mood. Sometime it could burst more, the anger are flowing uncontrollable by both sides. The media’s live today is currently watching by many thousands of people who could get into negative thoughts about the protest. They must stop; the words are not like water to dry after sometimes, the issue is nothing related to cinema which is one of a powerful entertainment industry of India. It is parallel today without looking at any variation, so why should u hurt each other and distribute the friendly relation. Language is to communicate and the states are separated by language to understand easier, but not to bring separation in united India. There is one common language, silence. Keep silence, think silently what is true. Think about India, we all are Indians and don’t use any language to separate ourselves. In today’s world people struggle for drinking water, here we have but mind lacks to give. I wish there is nothing to wait till some government to take responsible the karnataka, where they are also going to do the same creating some anger people against Tamil people. So we have only one option is to make all rivers national, which could be a long time solution, but to bury the violence now we are empty hands. People are looking above the central govt. for a temporary solution which is like an immoveable statue. It feels those who are not obeying the court order, are they going to agree with central government. If the police are not going to control the violence, then the president should call for army to save innocent people from politician and demons. Tamil or Kanada it is one in India. Pray for a peace. The relations between states are uneasy always, esp. when it comes water sharing. Feels the people of Karnataka are not against us or the Hogenakkal project; only the politician, who seeking for a profit for there political development and to earn peoples favor in upcoming general election. Is that nice to see people in Karnataka attacking and working against whatever linking with Tamil and people here does the same just destroying whichever is related to Kanada opposing there protest? The problem is between both state governments and it is only there response to solve. It is to condemn they are allowing the local kanada organizations and local politicians to jump into violence and giving trouble to specifically people belong to Tamil and destroying their worth properties. Generally the first thing disturb in the neighbor state of Karnataka is the entertainment industries, where the screen of Tamil movies where torched by angry mobs and Tamil channels are banned to relay. Next is destroying the buses and burning something which is there favorite activities and stopping the crossover of citizens. Tomorrow both the film industries are to join in opposing for each others agreement on the water project which will benefit for thousands of people in Tamil Nadu. Seems it’s not a friendly move, and the person who could be a central to make the matter smooth is just watching without any action and it doubts that it is looking for any positive thing to bring their party to rule the state. Truly no one has rights to ask Tamil Nadu govt. to stop going ahead with project where we have full rights to operate the system. Ones they released water from dams, it belong to this state boarder soon it enters and what we do with it is depend upon us. People know who the politicians are; it proved the harder minds of them just leaving the state into presidency rule without bringing unity in alliance and give and take policy. Only one thing I wish to tell is, don’t destroy the unity of varies people belong to one community, India. Let’ wish for a peaceful situation to stay along with people of both states. Scribbling something when I have nothing to write. here! Does human kind losing in this world? If I tell yes, I am blind. No, sometimes their happen that only happens in imagination, but knowing it was true, I feel affection and mercy haven’t fail to treat the wrong person the right. Just think some one stops us in the way threaten with knife to steel our money, what would we do? 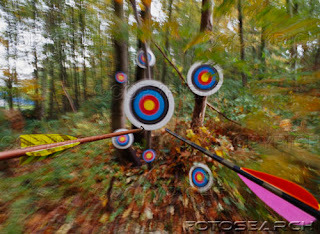 To save the life, we give away the money not with a broad smile, but with distress anger after losing to defeat him. Here, one did the same with kindness, thinking from the heart of intend who wants to rob. "If you're willing to risk your freedom for a few dollars, then I guess you must really need the money." This what Diaz told to the robber, who was a teenage boy approached him with knife just for money. Daiz not only gave away his wallet, but also his coat and told if he is going to robbing some more people the night it will help him to keep warm. For more about the scene, look here. For me, who went through tidings of some incidents happen in India, where people are cruelly beaten by mobs for involving in stealing and small offenses; Diaz approach was astonishing and even wows there are still people to show kindness, for what other did for us is damned. How many Diaz are there to turn people on right path just approaching with kindness? And also we can’t sure all robberies would be accepting it gently taking it positive like this teen. His care on society as a social worker is treasure; he stands example for others to learn from him that treating someone with kind even who harms us is pleasure and helps them to feel differently as positively.